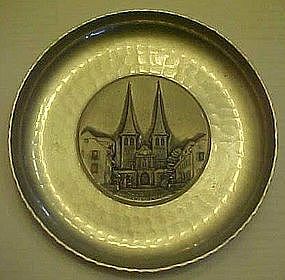 Vintage souvenir plate/dish from Luzern Hopkirche Switzerland. Dimpled or hammered pattern with a detailed central picture of the cathedral and street. Measures 5 1/2" in diameter and are in very nice condition. with no dents. Stamped on the back SIRG SIGAL. They even have the old tag from the Nordmann store when they were orininally purchased. I have 2 available. Price is for each.